Located in beautiful Northern Arizona, the Verde Valley Wine Trail invites wine enthusiasts to experience a destination rich in history, beauty, and the production of exquisite Arizona wines. There are seven Arizona wineries and eight tasting rooms on the Verde Valley Wine Trail that offer a variety of skillfully crafted wines to satisfy any wine taster's pallet. Every winery has its own unique personality and distinct wines for visitors to discover at each stop along the Wine Trail. Visit the great wineries and tasting rooms nestled in the red rock countryside and lush canyons surrounding Cottonwood, Jerome, Sedona, Clarkdale, and Cornville. Come and celebrate Wine and Art all in the name of a Good Cause! The Cottonwood Chamber of Commerce presents a unique public art exhibit: Painted Barrels on the Verde Valley Wine Trail!Wine barrels turned into canvases have been painted and sprinkled all over Cottonwood and the Verde Valley to celebrate the Verde Valley's wine industry and its local artists! Forty Wine Barrels are on display in wineries, tasting rooms, and businesses. See the barrels! All are amazingly creative with whimsical designs that really show off the beauty of the Cottonwood, Sedona area. 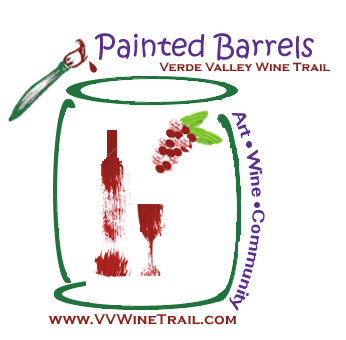 The Painted Barrels are one more reason to connect with the Verde Valley Wine Trail while you are enjoying the Cottonwood/Sedona Red Rock Country.